[justify]As part of my series of pics showing 101 dalmatian characters as giants in undies, diapers etc this is the latest one of a giant Patch which as you can see here has grown even bigger than last time! He's gotten so big he can pull buildings out of the ground! The story behind this pic is of a giant Patch walking around, looking down at everything below him, when all of a sudden there is a loud earthquake sounding noise! It's Patch's stomach growling that would be loud as a giant roar when he's that big. As he looks at his belly hearing it rumble and growl he looks around wondering if there's anything to eat. "I wonder if there are any cookies around?" he says out loud. 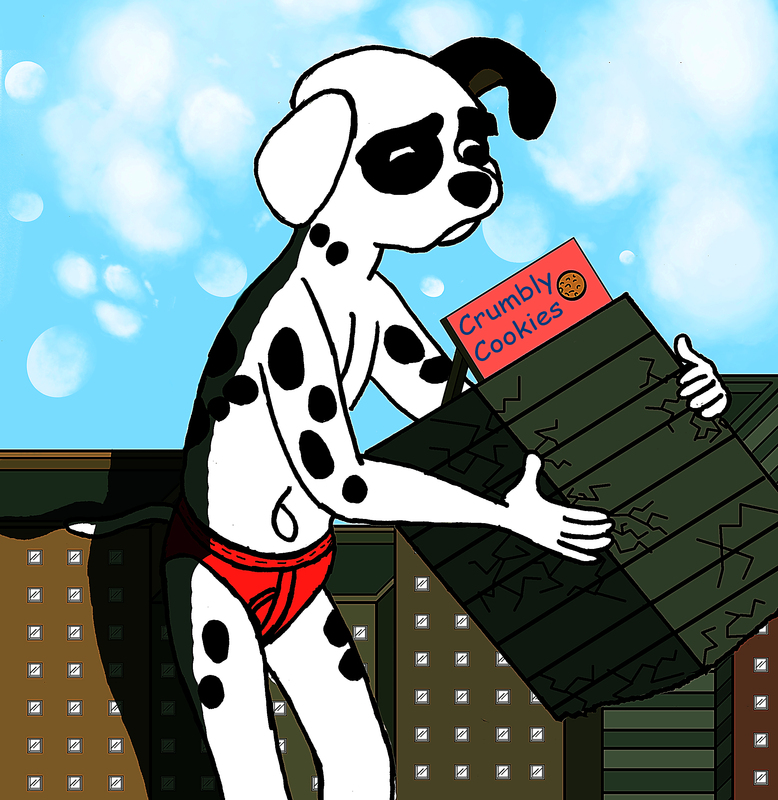 As he walks through the city he see's a building with a big billboard on top saying 'crumbly cookies'. "Cookies!" he shouts and he rushes over to the building and pulls the top half off! "Aww nothing but crumbs" he says looking into the building which he then throws halfway over the city! He sits on top of some buildings looking sad now realizing that there are some downsides to being a giant. "Guess there's no cookies big enough for giants"
This is the first pic I've done of Patch for long time. I will of course be doing more works of Patch as a giant and some other dalmatians. Thanks. I believe there may some more candy or something around.